After a week off work Chuck returned today and the boys I watch came back. I was sad to see Chuck return to work but it did feel good to get back some of our routine. Megan will be with me for another week before returning to school. Before Chuck returned to work we worked on putting the Christmas décor away. There was so much stuff that we no longer put out so we went through everything and ended up with an overflowing box for charity. It felt good to lighten the load. I know that some people feel let down once the décor is put away. Not me! I thrive on the feeling of simplicity. Menu planning was a little lax the last month so it was time to get back to that. Having a menu plan helps me to start dinner early and avoid the temptation of running out to get something. The "to do" list is also back in action. Having a list helps to keep me accountable. Not to mention that I love to mark things off the list! As much as I love the holidays I also enjoy the ordinary days. I am looking forward to my slow, simple routine! Megan treated her grandparents a recital of "The First Noel." Megan ended up with a cough and stuffy nose the week before Christmas. The day of her school party she told me that if it wasn't party day she would stay home. Not something she does often since she loves school. I let her go to school and could tell she wasn't feeling well when I arrived for the afternoon party. She started running fever that evening. 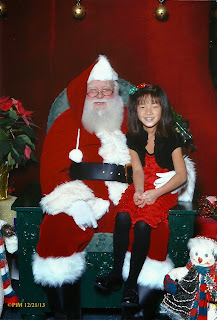 Thankfully she bounced back in a few days and was able to visit Santa. Many of our evenings have been spent playing games. The one activity that we did was a gingerbread house. Christmas Eve our first stop was at Grandma & Grandpa's house (Chuck's mom and step-dad). We then joined family for a nice meal at Olive Garden to celebrate my dad's birthday. Megan was up at 5:30 Christmas morning. I knew there was no way she would go back to sleep so we rolled with it. I am so glad that we did. We were able to watch the sunrise and it was breathtaking! Chuck sure surprised me. This is my gift. The hit of Christmas morning was Battleship. This has been played often. After a quiet morning at home we were off for two more stops first was Chuck's dad and stepmoms and then later to my parents. You can go ahead and shake your head at the amount of gifts. I do every year! Every year we tell Chuck's dad that is too much. As you can tell he doesn't listen. Even Megan said something about them. She pulled me aside and said "don't you think the amount of presents are a little much?" Thankfully she understands the true gift we are receiving at Christmas. Chuck has been off all week so we have spent time doing a little organizing as things are put away, reading, playing games and tomorrow morning we will put the décor away. Growing up this is the recipe that my mom used. It comes from a cookbook where the pages are falling out and there lot of splatters on the pages. That, my friends, is how you can tell a well loved recipe! Cut in 1 cup softened butter until crumbly. Mix to form dough. Chill slightly and then roll out dough. You can sprinkle with sugar or bake plain for frosting. Bake at 400* for 8-10 minutes. Ginger and Snowmen will be joining Megan at school tomorrow for another bake sale. There is something special about watching the first snow of the season. We received about five inches and thankfully missed all of the ice! The kids were begging to get out and play. The boys didn't bring snow pants so I ended up bringing in the snow and they had *snow* much fun! Many different kinds of pies were made that afternoon. Saturday afternoon we went to my parents to bake cookies and I packed Megan's snow gear. She had a blast playing with her cousin. Sunday afternoon Megan and Daddy headed over the Papaw's house for some sledding. It was her first time and I was sad to have to miss it. I wasn't feeling well and ended up at Immediate Care. Once again I have bronchitis. Ugh... hopefully it won't linger on as it did last year. Apparently she had a little trouble steering and keep going off the sledding trail. Chuck said it was good for a few laughs. I am looking forward to hitting the hill with her next time. The second grade class at Megan's school were drawn to host bake sale during the month of December. Not the best month for me to have extra baking, but I am making the best of it. This week I sent in a little cupcake love!